Tomorrow I will upload them again. Not really an issue to update the RHDN mirror though, will just do that again. btw you can just upload it straight there tbh and skip the intentionally expiring file hosts. I'm sorry, but this patch can't be used in any other ROM than the version it was made of. To have a Green Version in German, we should create a new hack from scratch, figuring all the offsets again. Right, my bad, I assumed that the colors were blue from the screenshots posted here. Haven't had a chance to test it yet. And that's too bad. I was hoping it would be somewhat easier, since you also created a patch for the Spanish version. I know the patch won't work on a different version as is, but I figured since a patch already exists, modifying it to work with the German version would be easier than starting from scratch. It's there really no way? 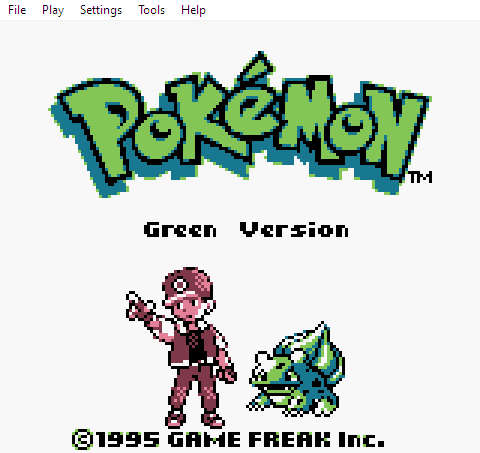 Oh, and by the way, Lavender town in Green apparently has a slightly different BGM than our Blue and Red. You should totally fix that as well! If you didn't already. Also, you should activate ESTILO BATALLA of MANTENER to CAMBIAR if you want change your Pokémon after beat the opponent one. And MrMaki, the color will depend of the console/emulator you're using, if your emulator didn't support any color like the first Game Boy, it will have just pallets of white, gray and black. 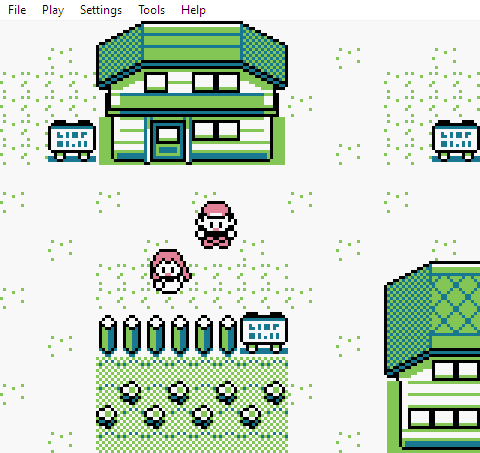 (The real gameboy had a green screen and these colors mix up, some emulators use screen filter to mimic this). If it support Game Boy Color, the colors will be set depending of your version, each version use the own color name as default color, and mix also dark blue, pink, dark green, white and black (if I remeber well) like Game Cube Game Boy Player and Game Boy Advance. If it support Super Nintendo/Famicom - Super Game Boy 1 or 2 - Cartridge, then it will show the same configured colors, no matter the version you're playing, it is like the Pokémon Yellow USA (the JP version didn't have own colors) that depending to where you're walking the colors change, the Pokémon also have own colors, in my opinion this is the best color set, used also in Pokémon Stadium. but I prefer GBC colors, because I grown playing one :P.
I am excited for your next patches Montblanc, until then I will search for more bugs, I read everything in Cinnabar Mansion and it's clean, no typos found (at least for me, a non english speaker). Ouch. I have an account there, but never uploaded anything. Do I have to be listed as one of the authors to edit the page? I was planning to send the Spanish patches too when the red ones were finished. It's there really no way? No, unless we redo everything again (and inserting the 151 sprites and repointing them again was a pain, lol). I guess another possibility would be copying the texts from the German version to pokered and then redoing everything again, that way you can avoid having to change pointers by hand. I looked at the Lavander Town theme back then, some bytes where different but the data was incompatible. The other BGM had different data too, so I assumed they changed the sound engine. Do you hear any difference between the two? I think the differences can only be felt by using stereo earphones. I don't know if it's real, looks like the lavenders creepy pastas make the people think about there's an older version than we know. so this will be the last patch? Fairly certain more or less anyone can edit the entry on RHDN, you are listed in the credits anyway so it gives you even more credibility if you try to upload a new version lol. The just add in Edit Reason, "Upload new version" etc, maybe with small changelog or something. It'll get added to the queue and the entry will be updated once it gets approved, which shouldn't take -too- long. I keep the English patches backed up on my Dropbox either way, if anything has to go wrong. Someone else would have to take care of the Spanish patches though because I don't personally care enough about it. Ok thanks, now I have to think a proper description for the Spanish ones, but I'll just wait a bit after they are well tested. It was a bit confusing now with four ROMs and four optional patches for each one lol. Did you submit the English Red? No, I've only been submitting English Green since that was the main one of interest, and the page was originally for English Green as well. I've just been uploading the .zip directly as you've been making them available, so when someone gets it on RHDN they have green_full and green_upgrade, with the optional patches, and I've got a quote from your original post in the description that explains what the different patches are for. I haven't submitted any of them since 2.2.1, figured I'd let you do it :p I can do it though if you'd prefer. I keep both, I don't personally care as well but I will do this for help people like Alexander who speak spanish. Now you have finished the Red and Green, do you intend to do Blue Restored? The only details you will have to care is probably text (censorship, references etc), town map border tiles and insert Gym Leader names to the Trainer status screen. I don't know if there are more work to do besides this. How hard would it be to just insert the German text into your Pokemon Green? Everything else should stay the same, no? I have no experience in Rom hacking whatsoever, but if you tell me that that's all I have to do, and it's doable, I will try and learn. This would mean creating a patch for the patched Pokemon Blue, right? Is that even a thing? Now I have concluded Green, I'm playing Red, I'm reading everything (NPC, signs etc) serching for a typo, maybe a bug like the Cinnabar I reported before, searching for comparisons between US and JP to see if there are something missing. And I think I found! What do you think? Could be a good idea do restore this as well, right? I think these missing lose speeches is used on the original Red&Green. I cannot have certain because I would have to play the JP ones and understand japanese to confirm. If you know someone who understand japanese to play until discover if this actually happen in JP version and confirm it, so, I ask to you restore these missing lose speeches as well. In my opinion, this was used, but after translated, they (translators team) didn't understand when use each, so they repeated the first one for the first Rival Trainer Class and discarded the other speeches. Everything seems OK, no bugs or glitches found until second battle against rival on route 22. I have read everything and catched every single pokémon available for catch in both games, I also traded the exclusive ones and now I just need evolve them by level and evolution stones, no glitches or typos found in pokedex entries, sings, NPC dialogues, events, graphics or encounters found. Now I'm going to Victory road and Elite 4 to finish the last trainers available and grind all Pokémon to evolve. After that, I will share my save files with every Pokémon evolved and every TM on PC (I'm a TM Collector :P). Anyone could reupload patch 2.3 to Mega/MF/Drive please? This is too good to get lost on a temporary file hosting. I figured Montblanc was going to upload to RHDN on his own but I guess he hasn't and probably never will. I sent the submission to RHDN. Might take a few days. This is only for English Green 2.3, by the way. I have English Red 2.3.1 but I'm not 100% sure how to go about it as far as RHDN goes. New hack page? Merge it into the current English Green page? I don't have the Spanish patches, so someone else would have to take care of those if someone wants them. Don't worry! I have all recent patches on my OneDrive, I have waited a few years for this kind of hack (I'm too glad for MontBlanc exist, he is my hero), I will not let this be instinct. I have included spanish ones on my backup, so, I will share here at any moment if someone ask for. Maybe i can help you to translate the Game in German? I had found the 2.3 version on Romhacking.net, not sure how many changes has with 2.3.1, but also I'm searching for the Spanish one. So if you can share them I'll be very happy. Green has no 2.3.1, that was released for Red because Montblanc forgot to change BLUE in default rival names to GREEN. Then the only thing left is the Spanish patch. I'm searching for the Spanish one. So if you can share them I'll be very happy.